When an enemy creature becomes Shackled, deal 3 damage to it. Dres Tormentor is a rare Intelligence creature card. It is part of the Core Set. "I'm a slaver. We're not known for our patience." 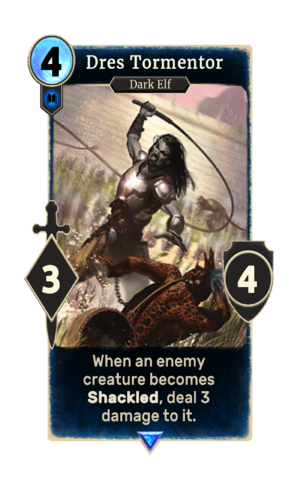 This card was previously part of the training mechanic where it could be upgraded from Dres Guard at level 16. The card is named for House Dres. This page was last modified on 14 February 2019, at 01:04.